A year on from first becoming aware of the Sunday School Three and the incredible story of the emergence of their memorial tablet from a pile of compost in the rectory garden, it was time to make a visit to their final resting places. They were all killed in three terrible battles and none of their bodies were ever recovered, consequently their names have been engraved on memorials to ‘those with no known grave’. These are in a corner of northern France, not far from the Belgian border and no more than 25 miles apart. William Mace’s name is on the Le Touret Memorial near the town of Bethune. 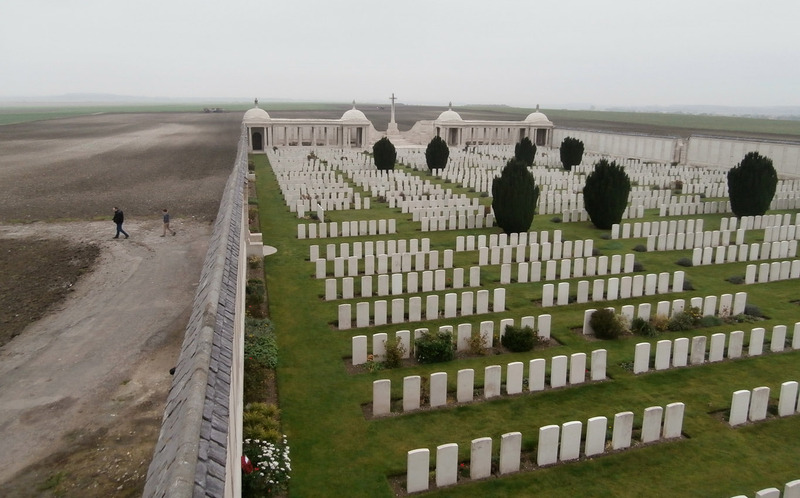 James Crozier is on the Loos Memorial just outside Lens. 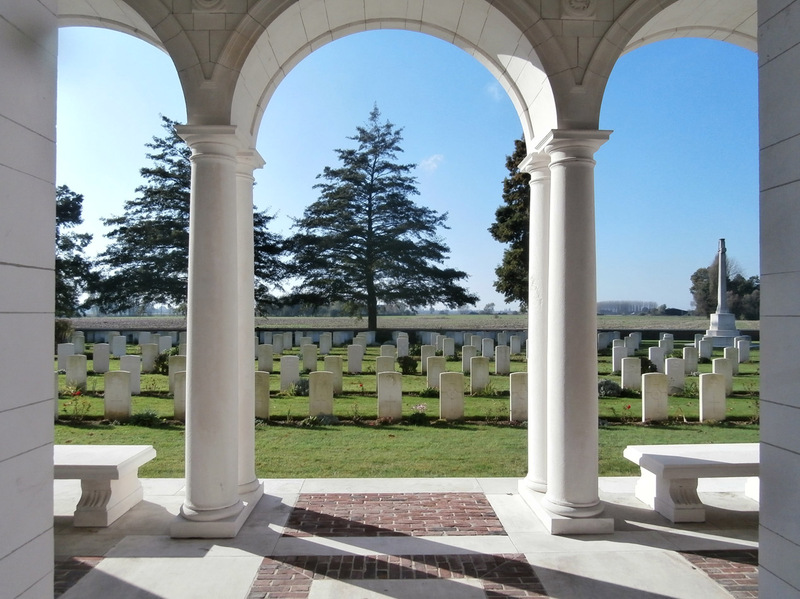 Albert Gibson is one of 35,000 names on the enormous Arras Memorial. We travelled to France and Belgium earlier this week to visit these memorials and other cemeteries where we know members of the Summerstown182 rest. It was a hectic schedule but we were blessed with fine weather and the expert guidance of Bart Seynaeve from Gullegem. In the space of three days we saw a total of 39 of our 182 names carved into the white stone, either on a headstone or a memorial. Le Touret was difficult to find, on the edge of Bethune close to a spot where our Great Uncle lost half a finger in an unfortunate skirmish in a trench with one of his own men. Willam Mace died in the Batte of Festubert which over four or five days at the end of May 1915 claimed the lives of 12,000 British soldiers. 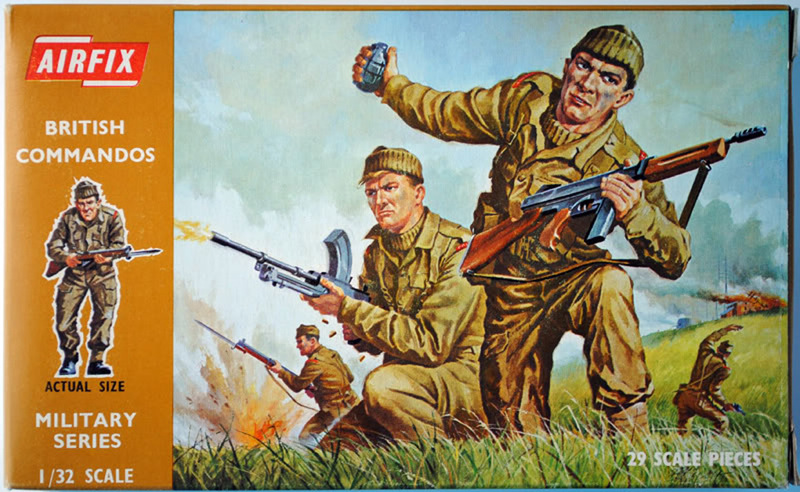 It was also famously where the British Army ran out of shells, hard to imagine considering the never-ending stream of them seemingly popping out of the ground today. It was a sobering thought to imagine this place was the last stand of that long list of names in the South Western Star newspaper. The 23rd London Regiment’s ‘Gallant Charge’ and the end of the road for so many young men from south-west London. 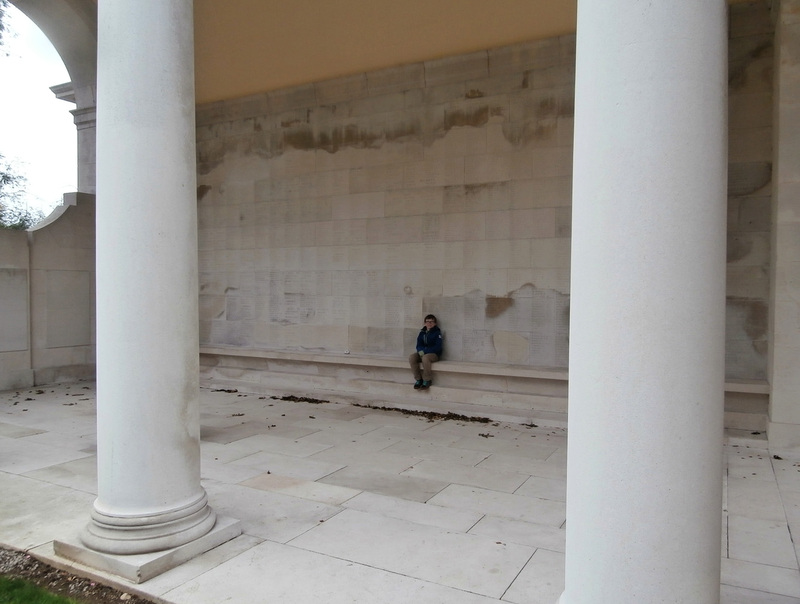 The countryside of course now radiates tranquility but the memorial itself was a hive of frenetic noise and activity. Restoration and sprucing-up was in full swing and at least a dozen workmen were hard at it. I felt sorry for them, they are doing great work but anyone visiting the cemetery for quiet reflection was in for a surprise. The idyllic and peaceful nature of Huntspill Street and the whitewashed home of William Mace at No39 may conjure up a vision of a Greek island, but the Le Touret Memorial with its arches and colonnades is more like a Roman temple. In the central courtyard of this elegant structure we found our man quite easily and his panel was literally dazzling in the lunchtime sunshine. Keeping him company are three other Summerstowners; George Boast, Cecil Passingham and Robert Lake. 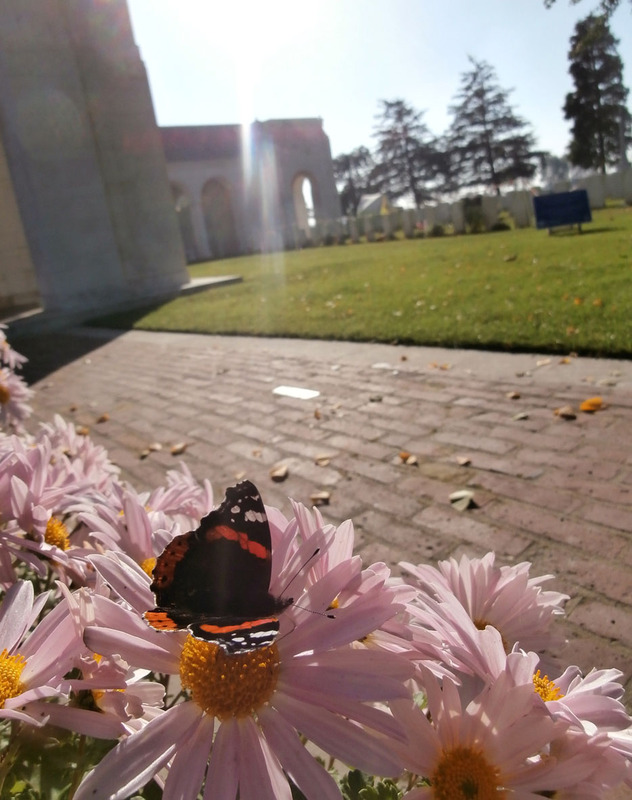 To cap it all, a pair of beautiful Red Admiral butterflies dutifully posed for us on some pink daisies at the cemetery entrance as we made our way out. The following day, the mist hung heavy and the temperature dropped by about ten degrees. It suited the mood. With Bart at the wheel and his SatNav firing on all cylinders, the graveyards came thick and fast. 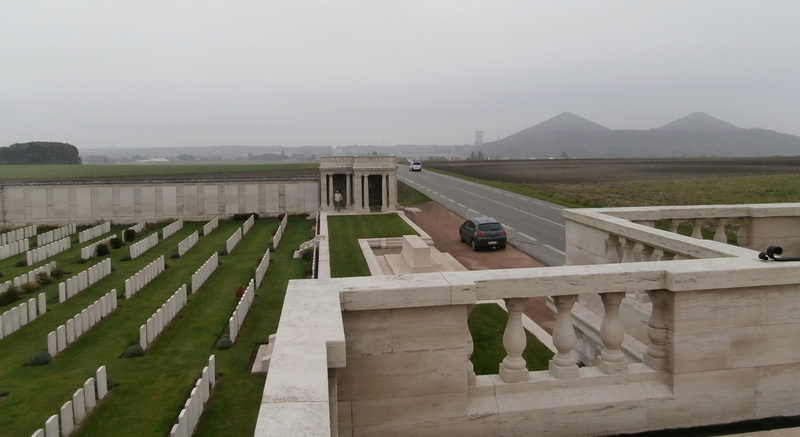 The Loos Memorial emerged very swiftly out of the mess of ring-roads and industrial units on the perimeter of Lens. Suddenly the ground was pancake flat with the striking exception of a number of pyramid-like slagheaps – a testimony to this area’s mining heritage and a reason why the fighting around here was so difficult. This was the dreadful place where two civilised nations decided it was a good idea to fire poison gas bombs at each other. It was cold and bleak, the landscape almost lunar. The walled memorial with its 20,000 names was like a fortress surrounded by endless acres of cultivated farmland. Bart went for a wander and spotted a couple of rusted hand grenades which had recently been churned up and presumably tossed aside by a farmer. The area was once known as Dud Corner for the amount of unexploded devices found here at the end of the conflict. Once again we found who we were looking for quite quickly. James Jenner Crozier from Smallwood Road has his back to the twin spoil heaps knows as ‘Pits 11 and 19’ and recently classified as a UNESCO World Heritage Site. His companions here, William Copeman and Percy Randall are on different sides of the memorial so they can all keep an eye on each other. But certainly on this greyest of days, beneath the most leaden of skies they could have done with some Summerstown daffodils to brighten things up. Arras is only about ten miles south of here and the vast Arras Memorial is fairly close to the centre of the town. There are eleven members of the Summerstown182 remembered here and one of these was the third Sunday School teacher, Albert Laurence Gibson. There was more drilling and tarmacing to deal with, but this time it was the dual carriageway outside the cemetery. 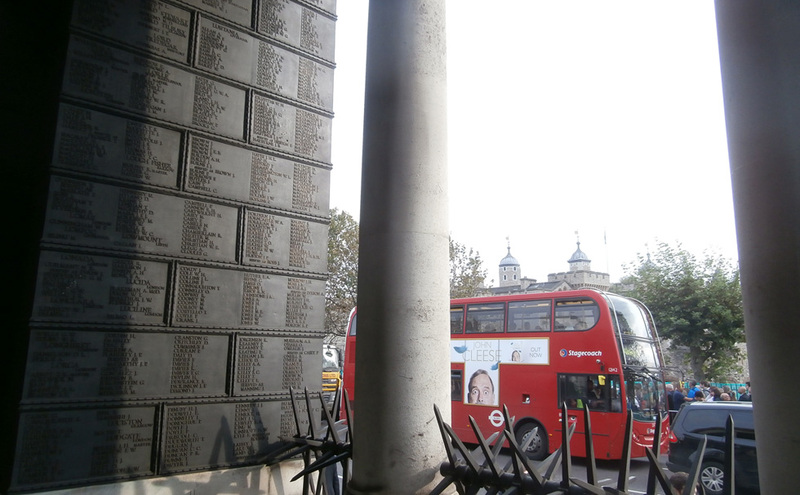 On this enormous sprawling edifice designed by Lutyens, are the names of over 35,000 men killed in the Arras sector between 1916 and 1918 but largely the Battle of Arras in the spring of 1917. Lance Corporal Albert Gibson from Waldron Road lost his life a little later in the fighting at Cambrai in December 1917. With its columns, arches and walkways, it also has a Roman feel but perhaps starting to decline. Some of the names are barely readable, the stone is dis-colouring in places and its going to need a bit of attention soon. We found that splashing a little water on some of the worn-away names aided legibility. Albert Gibson was tucked away on the western side of the memorial and didn’t need any dowsing. Not too far away from him Pete came across a little wooden poppy cross bearing a tribute to Sandy Turnbull, the man who scored the winning goal for Manchester United in the 1909 FA Cup Final. He was killed on 3rd May 1917, the same day as William Pitts from Hazelhurst Road whose engraved name we also found. Also killed on that day and in the same Bay Six as Sandy Turnbull is Christine’s relative, Charles Sharples from Fairlight Road. He somehow evaded the St Mary’s Church war memorial but not our camera. These are exciting times for the Sunday School Three. Not only have they all been visited in the green fields of France, but their tablet has been cleaned up and will be present in church on Remembrance Sunday. This promises to be a remarkable occasion when the names on the war memorial will be read out in full for probably the first time since it was inaugurated in 1919. If you would like to read the full story about the Sunday School Three and their special memorial, please see the link in the main menu. The middle of half-term week probably wasn’t the most sensible time to visit the Tower of London poppy installation which everyone has been telling me is so wonderful. After a week in the tranquil cemeteries of France and Belgium, where for the most part we were the only people present, it was a bit of a shocker to be thrown into the seething mass of people straining to get a view of those red flowers. We came over Tower Bridge on our bikes and it was immediately apparent that seeing anything was going to be difficult. The moat around the tower is gradually being filled with 888,246 ceramic poppies – one for every death in the British forces in the First World War and the first glimpse of this really does take the breathe away. But this was no idle sightseeing jaunt, there was work to be done and it involved visiting the Tower Hill Memorial and searching for Charles Blight of the Summerstown182. The covered part of the memorial where we found him was almost like a sanctuary from the mayhem outside. Not just the hordes of people who had come to see the poppies, but the traffic, the tour buses, the builders in flourescent jackets, scaffolding everywhere and the incessant racket of drillling. Central London re-development gone mad, this was a world away from Caterpillar Valley and Fifteen Ravine. And in the middle of it all is Charles Blight looking out on the Tower and the madness. His name is on a prominent position at the front of the memorial which commemorates the names of 12,000 men of the Merchant Navy lost at sea in the First World War. 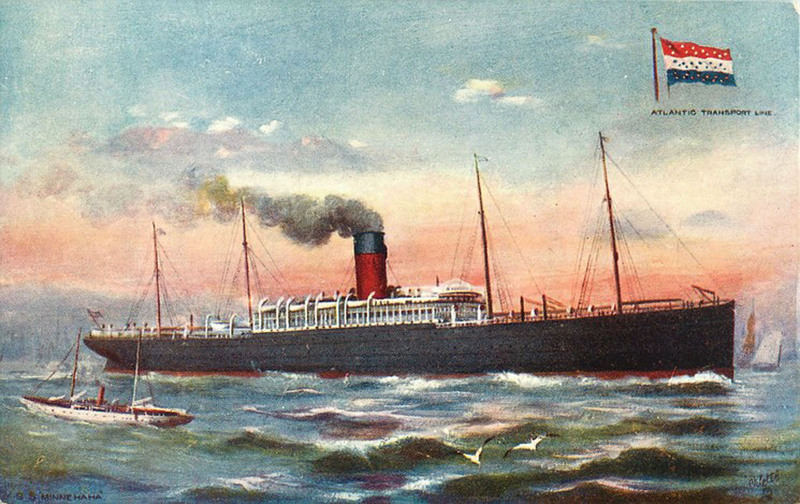 Charles was only 20 years old when he perished on a ship called the SS Minnehaha, a liner which ploughed the Atlantic between London and New York and in 1901 carried Mark Twain back to the United States after a decade in Europe. A product of the Harland and Wolff yard in Belfast, it carried munitions in the War and was in a convoy with five other vessels when sunk by a U-boat twelve miles off the coast of south-west Ireland on 7th September 1917. 43 lives were lost, 110 were saved. She went down very quickly, stern first, ‘with her bow pointing like a column in the air.’ Charles Blight was a wireless operator and his death was noted in the St Mary’s parish magazine in the same passage that Reverend Robinson refers to the loss of William Clay. 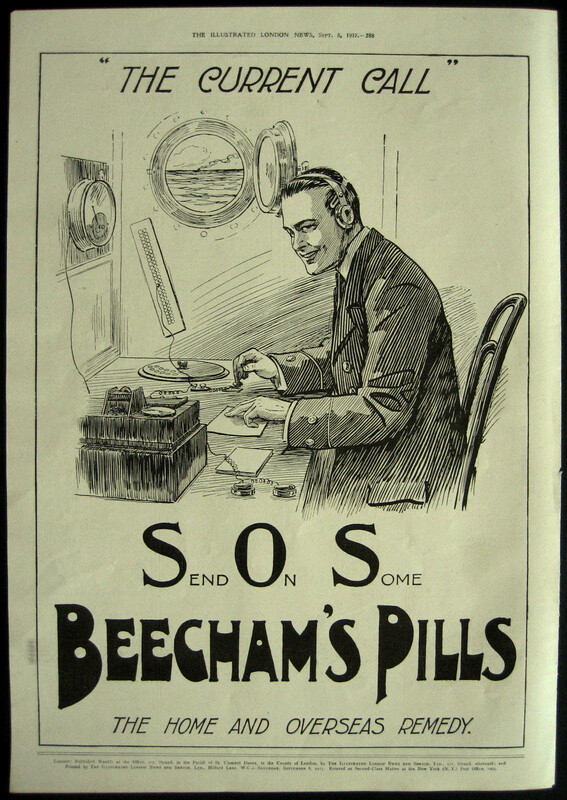 ‘His captain, who was saved, has written to say that he bravely stuck to his post to the end, and went down with the ship.’ It is possible that Charles trained with Marconi in Liverpool. Much of the company was requisitioned for war service and technological advances accelerated when it became clear how vital radio would become. The lad from Franche Court Road would have been at the cutting edge of these developments. Charles was born on 1st November 1896 in Lambeth and had one younger sister. His parents were both unusually-named, Oscar Enys Blight, who worked as a valet and Florence Serbella. In 1911 the Blights lived on the South Lambeth Road but at some stage moved to 46 Franche Court Road, the upper end of the street just before the turn where all the houses are still have the original brick colour. Its the second one from the end on the right hand side just before things go a bit Brookside. In 1918 Captain Frank Claret who wrote to Reverend Robinson was awarded the OBE for his heroism and saving eleven lives when the ship sunk. The New York Times reported how he ‘bobbed about in icy water, blowing air from his huge lungs into a leaky life preserver’ until rescued. He jumped from a life raft several times to rescue wounded or struggling men and that, ‘finally he himself had to be dragged into the lifeboat completely exhausted.’ Meanwhile, the wreck of the Minnehaha lies some 12 miles south-east of Fastnet Rock and is often visited by divers. She sits upright, her funnels and winches apparently clearly visible and her portholes still intact. Back at Tower Hill, I can only hope that young Charles has his headphones on to drown out the noise of all that traffic. 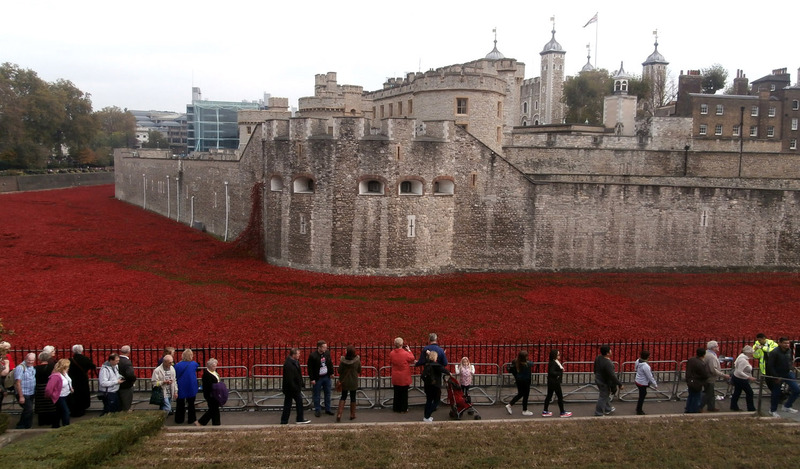 Part of the Tower of London poppy project involves the nightly reading of names from a roll of honour. Two of the Summerstown182 were submitted by Alison Milton and the names of William Mace and James Chenery were read out by Michael Morpurgo on 19th October 2014. The magnificent Dorset coastline stretching from Lyme Regis to Swanage has two Summerstown182 senitels. To the east is the Isle of Purbeck and the Jurrasic homeland of John Lander, the stonemason from Langton Matravers. Killed in the German Spring Offensive of 1918, Rifleman Lander lived for a while at the top end of Hazelhurst Road, just a stone’s throw from the church. Adjoining it was Foss Road, at that time a vital and populous artery connecting the church to the Fairlight. Vying for attention with its neighbour, it is now cruelly truncated by the Twin Towers and early seventies developments. Brian Willett grew up on Hazelhurst Road after the war and vividly remembers playing daily on the V2 bomb-site and fighting pitched battles with the ‘enemy’ from Foss Road. Ferocious territorial disputes which often required visits to Dr Rose to get stitches. Funnily enough Brian now lives in Dorset. Foss Road was once home to a seaman called Alfred Byatt who perished in the icy waters of Lyme Bay at the other end of that glorious strip of coast, the stamping-ground of Hugh Fearnley-Whittingstall and The French Lieutenant’s Woman. 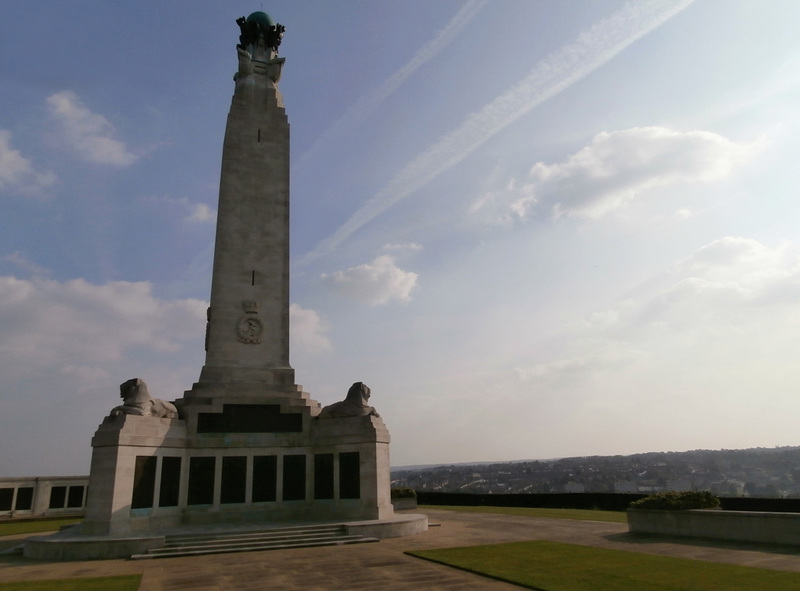 A few weeks ago in Chatham on a dazzling late summer’s afternoon we went up to the lighthouse-like naval memorial overlooking the town. We didn’t need the albino squirrel to help us find the names this time. They are organised chronologically and the shipmates are listed by rank. 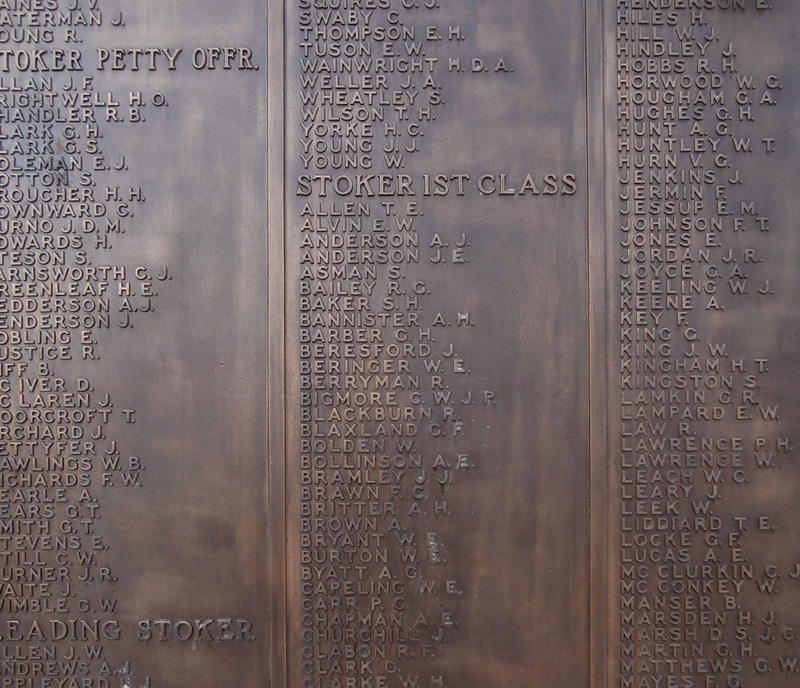 A G Byatt is one of six Summerstown182 names on the memorial and he was there in the list of First Class Stokers. Its hard to imagine what conditions he worked in. A temperature of 150 degrees, choking on coal dust, drenched in sweat and coated in grime, feeding the furnaces to keep these great battleships on the move. Also knowing they were beneath the water-line and likely to be wiped out at any moment by a torpedo. It was New Years Day 1915 when HMS Formidable went down with the loss of almost 600 men. Alfred Byatt was the son of Joseph and Louisa of 54 Foss Road. The house was about half way down the west side of the road with a birds-eye view of the V2 rocket attack of 1944 which destroyed most of the homes opposite. He was born in Earlsfield on 4th September 1894. In the 1911 census the family were living at No92 nearer the Smallwood Road end of the street and Joseph worked as a file hardener for a tool company. Seventeen year old Alf was employed in a fish shop, possibly the one at the bottom of Aldren Road run by the Tickners. He was the second oldest of seven children, four boys and three girls, squeezed into a three room flat. A fourth girl Dorothy who is not on the census was born that summer. She married an Ernest Gardner and was living at 32 Hazelhurst Road when the V2 rocket fell. They were two of at least 35 victims. A few doors further along, Arthur Hinson who lost a wife and two children that day was Alf Byatt’s cousin. Alf joined the Navy in September 1913 and in January 1914 secured a position on a ship called HMS Formidable. His record indicates that he was just over five foot tall, had a cross tattooed on his left forearm and was blessed of a ‘very good character’. HMS Formidable was a 15,000 ton battleship and was part of the 5th Battle Squadron and on manoevres in Lyme Bay when it was tailed by a submarine in the early hours of 1st January. It took less than two hours for the ship to go down. 581 out of a crew of 780 were lost, more than 130 of them were Londoners. The 199 survivors had a perilous time in freezing waters. 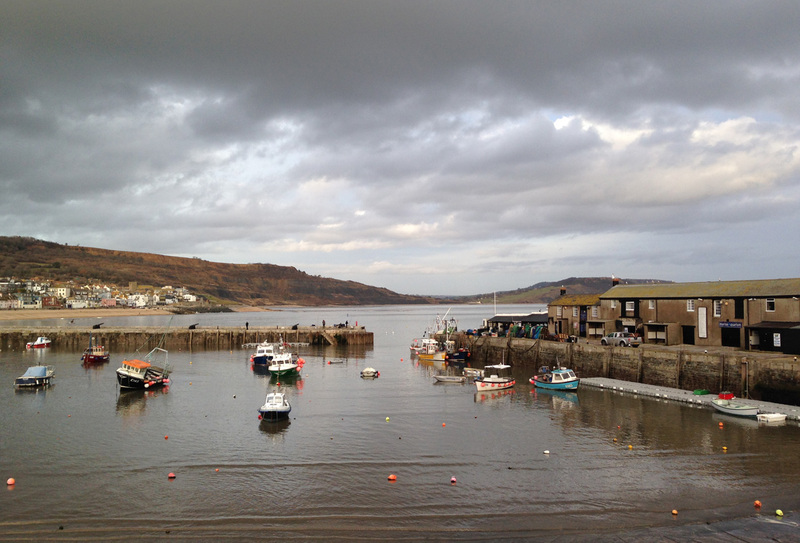 Some were picked up by fishermen from Lyme Regis where a number were washed up on the beach. One of these, John Cowan was presumed dead and taken to a local pub, The Pilot Boat. The landlord’s dog, ‘Lassie’ repeatedly licked his face and miraculously revived him. 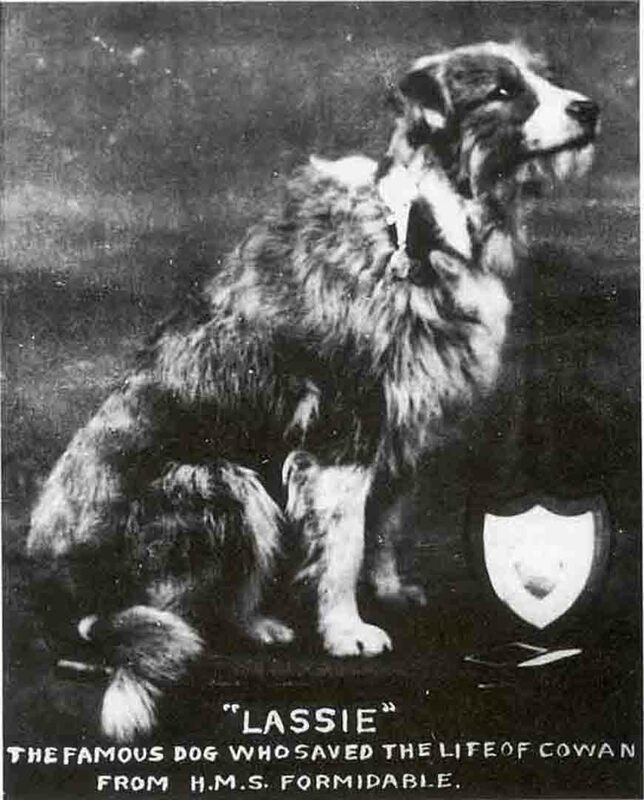 A postcard was produced and the canine resuscitator became something of a celebrity. Before long the story was picked up by Hollywood and the rest is history. A local tale has it that after the dog died, ghostly barking was heard until a replacement arrived. 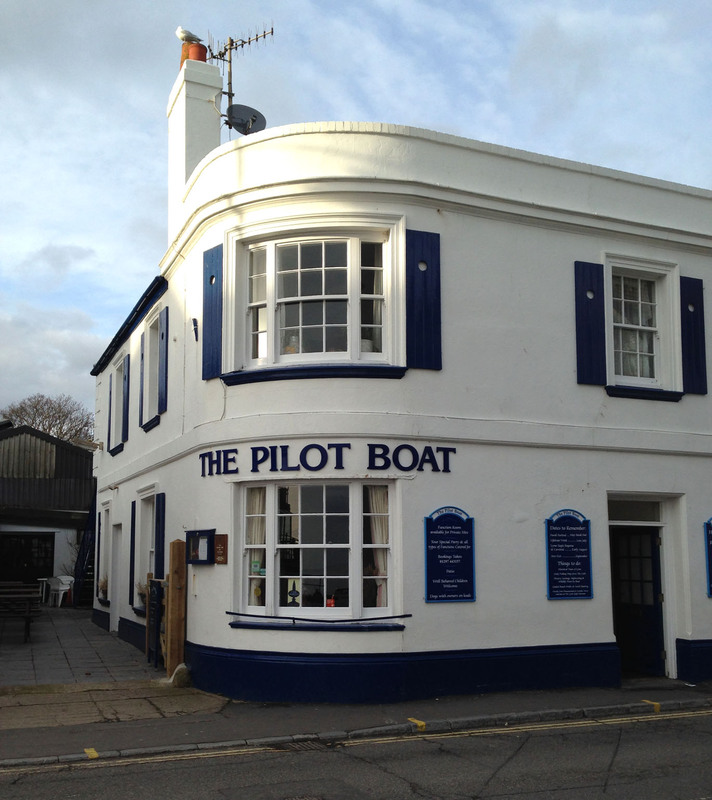 It wasn’t heard again until that one also died – the inference clearly being that the pub should always have a dog in case it was required to save a sailor again. Meanwhile back in Summerstown by 1918 the Byatts were living at a third different address on Foss Road, No5. Alfred’s older brother Joseph appears on the absent voters list as a Private in the East Surrey Regiment. In the Smallwood Road School Roll of Honour booklet, Alfred is third on the list of ‘Old Smalls who have died for their Country’ and Joseph is also mentioned. We’ve been told there are still some Byatt descendants living locally and it would be great to see if they know anything more about Alfred. Its exactly one year since the story about the tribute to William Clay appeared in the Wandsworth Guardian and triggered the momentum which kick-started this project. The research began with the three Sunday School teachers whose names are on the main memorial but also commemorated separately on a white marble and alabaster tablet. Reverend Roger Ryan famously retrieved this from a heap of compost in the vicarage garden shortly after taking charge of the parish. It is now in the process of being cleaned up and restored. How extraordinary and perfectly apt that this week we should make contact with Alison Milton, related to not just one of the Sunday School Three, William Mace, but two other members of the Summerstown182. It has been a momentous few days and we now have photographs of William Mace and Thomas Milton, the RAF mechanic whom we have cheekily christened ‘The Balloon Man’. To know a little bit about these men, to have written something about them and now suddenly learn a great deal more and see what they look like, is a chastening experience. All of us involved in the project feel particularly blessed this week. A little bit of very precious treasure has been unearthed. It all started when Christine and Marion got to work on a soldier called James Chenery whose Commonwealth War Graves Commission record connects him to 34 Bendon Valley. This is on the north side of Summerstown, where Garratt Lane passes Earlsfield Station and twists past the massive Henry Prince Estate on its way towards Wandsworth. Adjoining this are three roads leading down to the River Wandle which were once all lined with terraced houses; Bendon Valley, Lydden Road and Wardley Street. With a strong romany presence, it was a tough neighbourhood with a reputation for lawlessness. Today, only a few houses survive and the area is a mess of light industrial units and small factory spaces. No34 is probably under the immense box-like Mecca Bingo Hall which sprung up a few years ago. There is also a used tyre yard which looks like it would have been a very good location for a punch-up in The Sweeney. To cap it all, at the end of the road is the site of the original Airfix factory. James might have been born too early to see any little plastic soldiers or aeroplanes being made, but he would surely have seen the steady stream of worn-out nags heading for the Harrison Barber knacker’s yard. 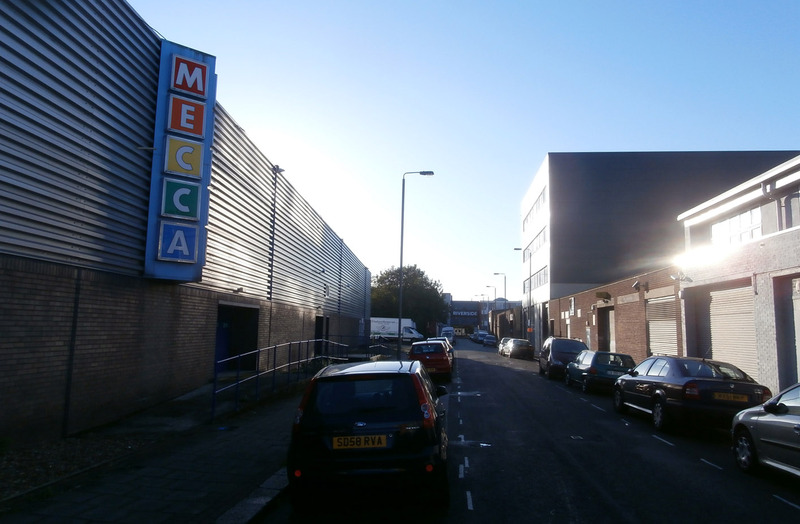 The biggest one in London, 26,000 horses a year were turned into cat-meat at this location. James was born, the fifth of nine children at 16 Lydden Road on 10th October 1891. Amazingly I’m writing this on his birthday. His father was a carman who died in 1909. Perhaps as a result of that James went into the army, because the 1911 census shows that he was a Rifleman in the Kings Royal Rifle Corps, stationed in Gosport, Hampshire. Meanwhile the family moved around, relocating to Fulham for a while before settling at 58 Wimbledon Road, then Huntspill Street and finally Bendon Valley. James entered France in December 1914 with the 7th Battalion of the Kings Royal Rifle Corps and was promoted to Lance Corporal. In July 1915 they fought at Hooge Crater, being the first division to be attacked with flamethrowers. By 1916 he was a Sergeant and the date of his death, 25th August 1916, indicates that he died in the defence of a place called Delville Wood on the Somme. 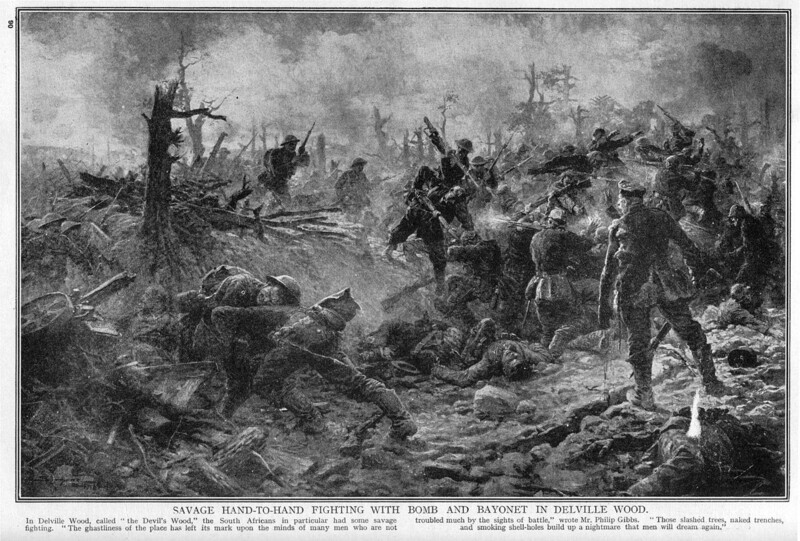 Between 17th and 26th his battalion fought the Germans at Orchard and Brewery trenches, sustaining 99 fatalities. One of the most horrific battles of the First World War, characterised by ferocious hand-to-hand fighting with bayonets, ‘Devil’s Wood’ is the South African equivalent of Gallipoli and the location of their national war memorial. 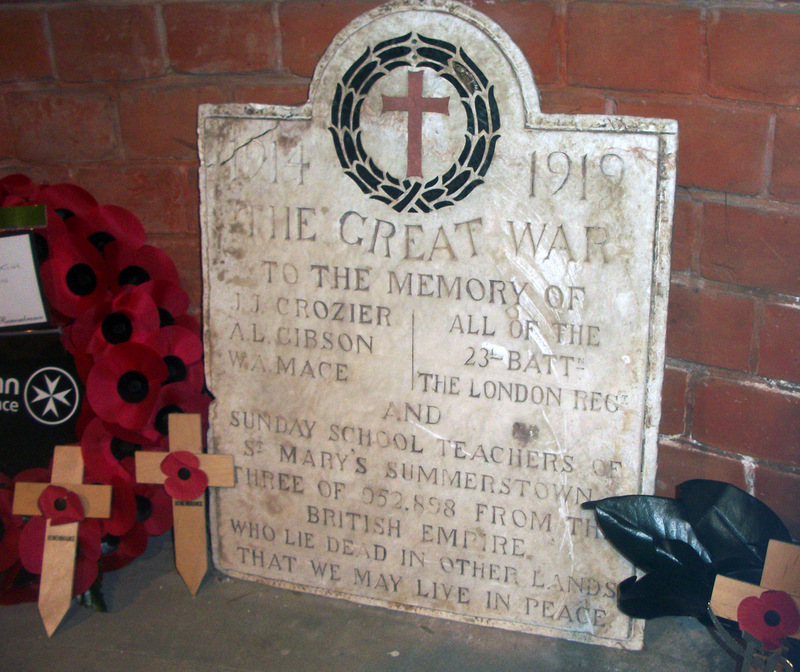 Along with eleven other members of the Summerstown182, James is one of 75,000 names on the Thiepval Memorial. Visible from many miles away, it bestrides the gentle pastoral landscape on the Somme, and is possibly the grandest war memorial ever built. James’ mother was a Mary Ann Milton and her nephew Frederick Forrester Milton, although not one of the Summerstown182, plays a key role in their story. Also in the Kings Royal Rifle Corps, the Churchman’s Battalion, he was seriously wounded in 1916. The following year, after six months recuperation he married Kate Victoria Mace at St Mary’s Church on 7th July 1917. She was the sister of Sunday School teacher, William and the couple lived at his old home at 39 Huntspill Street. Until they left the parish in 1930, the Miltons, both Sunday School teachers themselves, played a prominent role in parish life at the church. Frederick was heavily involved in raising money for the war memorial, and after it was built, a special role for them was ensuring a regular supply of fresh flowers for it. On it were the names of his brother Thomas Milton and brother-in-law William Mace, not to mention so many others he would have known. Christine got in touch with Alison through a genealogy website. She has told us that the daughter of her Uncle Fred and Aunt Vic (pictured below), a lady called Dora, aged 93, is alive and resident in Worthing. The niece of William Alexander Mace! How fine it would be to make a trip there and show her the restored memorial tablet which bears her Uncle’s name. Pevensey Road cuts a swathe through the Fairlight, arrowing down from Smallwood School, directly to St George’s Hospital where it briefly becomes Cranmer Terrace before taking you straight into the Medical School. There is the odd wobble along the way and signs that its taken a few bashes over the years. A couple of months ago I was introduced to George Dear who grew up on the road before the war. As a seven year old he recalled his older brother emerging bleary-eyed from their house early one Sunday morning, to see the tail fin of a V2 rocket just miss one of the turrets of Smallwood School. The blast hurled him across the street and into the gutter as the bomb smashed into the street beyond. 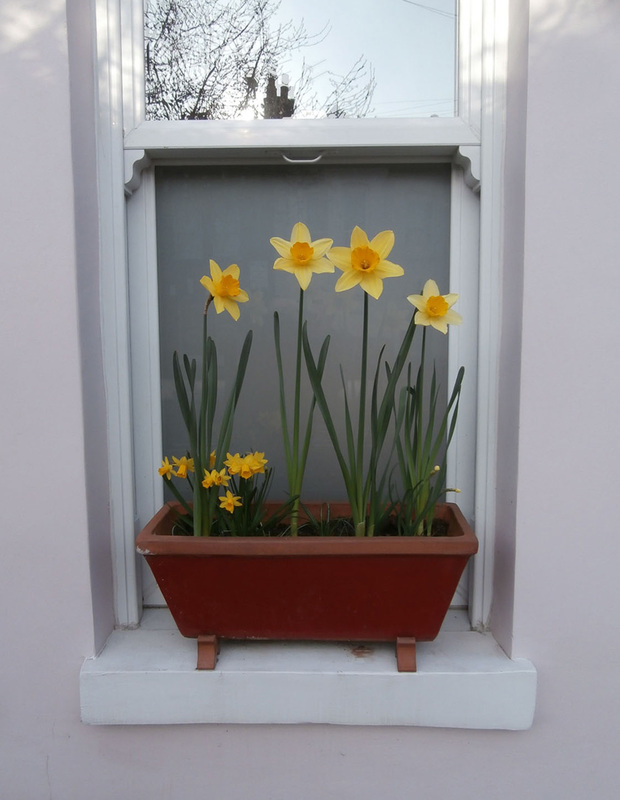 Green-fingered George is a daffodil afficionado and a few years ago he extensively researched the work of the reknowned plantsman, Peter Barr. Known as The Daffodil King, this extraordinary scotsman travelled the world in search of new varieties and back in the 1880’s he had a nursery round here at a place called Bell’s Farm, located roughly between the Fountain public house and Diprose Lodge. By 1903, like many of the fields of Summerstown and Earlsfield, Bell’s Farm and its exotic nurseries had been built over and one of the streets springing up in its place was Pevensey Road. 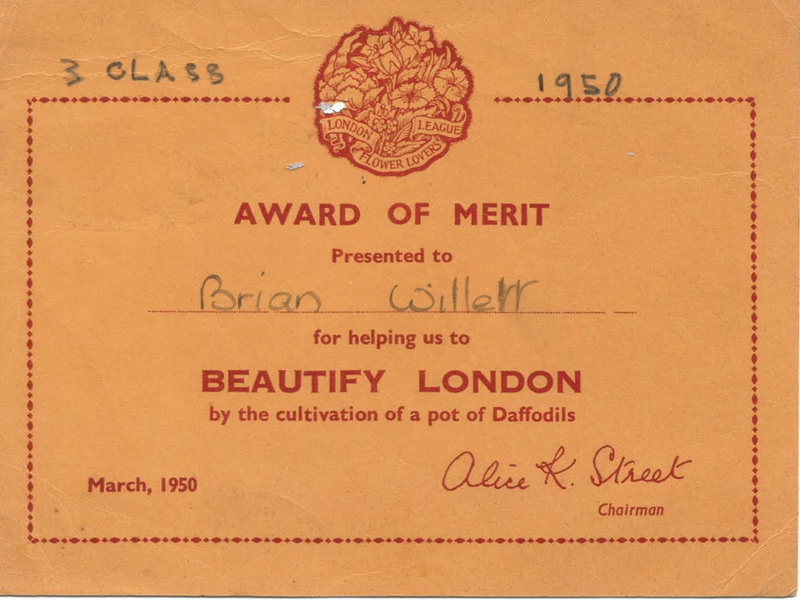 Curiously a few weeks ago, Brian Willett reminiscing about his days at Smallwood School, recalled that he still had his LCC daffodil-growing certificate. When the V2 struck, it flattened all the houses on Hazelhurst Road between Nos 14 and 44. Six month old Brian was living at No12. Then a woman who came on a walk told me that she has still got her certificate. Clearly daffs are part of the Summerstown fabric and long may they continue to bloom in our fertile plain. 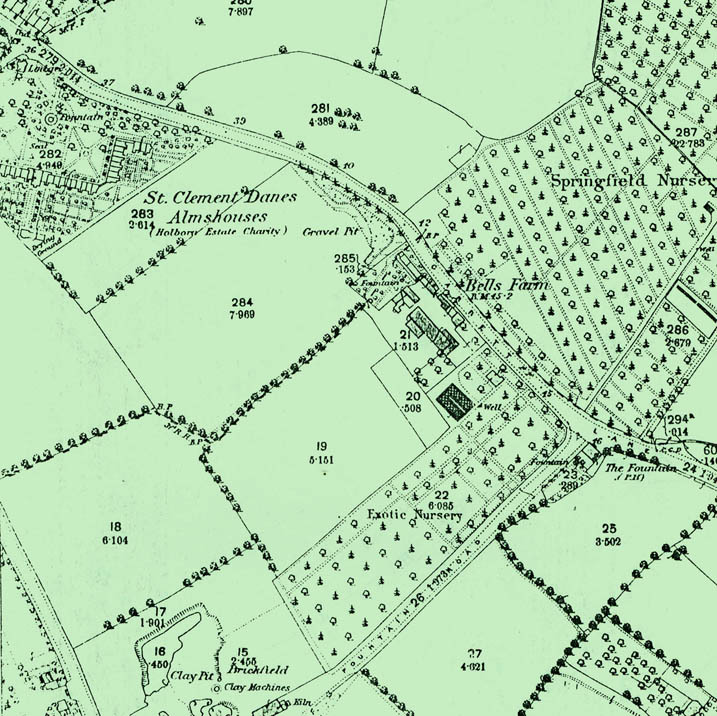 Twenty years before George came along, Pevensey Road was home to the Dell family. Originally living in Southwark, by 1911 they were at No13 Foss Road, right in the middle of the section blown away by the same V2 rocket that tossed George’s brother into the gutter. Albert Arthur Dell Senior was a railway worker and there were six children and what looks like Albert’s brother. In total, nine people in three rooms. His eldest son, also Albert was aged 17 and worked for a printers. William was 14 and a messenger with a bookbinders. 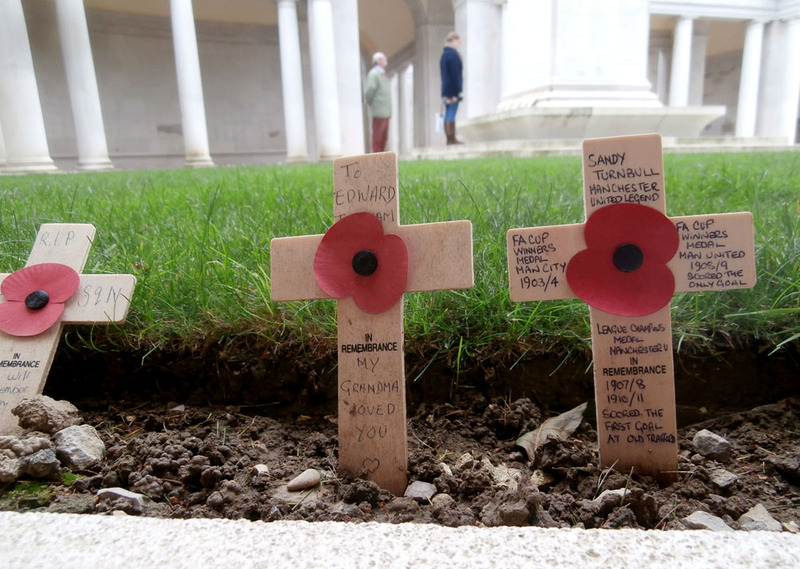 The two brothers were killed within a few months of each other in 1917, the year of stalemate. Aged 23, Albert Arthur Dell died on 11th September 1917. 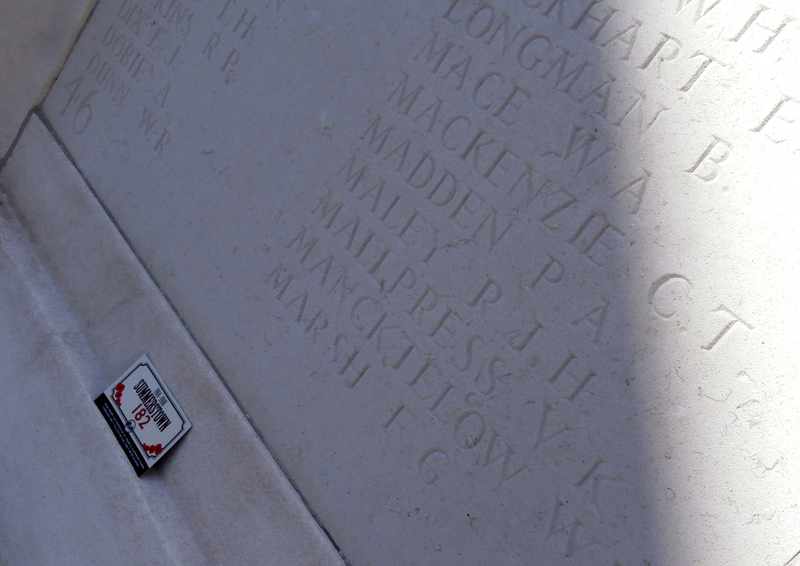 His name is on the immense Tyne Cot memorial just outside Ypres. This memorial bears the names of almost 35,000 men and it is the largest cemetery for Commonwealth forces anywhere in the world. 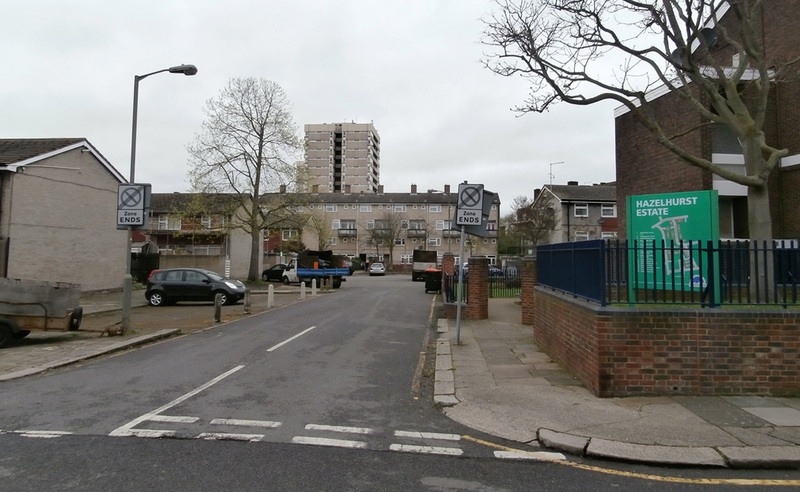 Two other Summerstown182 men are remembered here, Eldred Henden from Wimbledon Road and Joseph Lucas from Bertal Road. 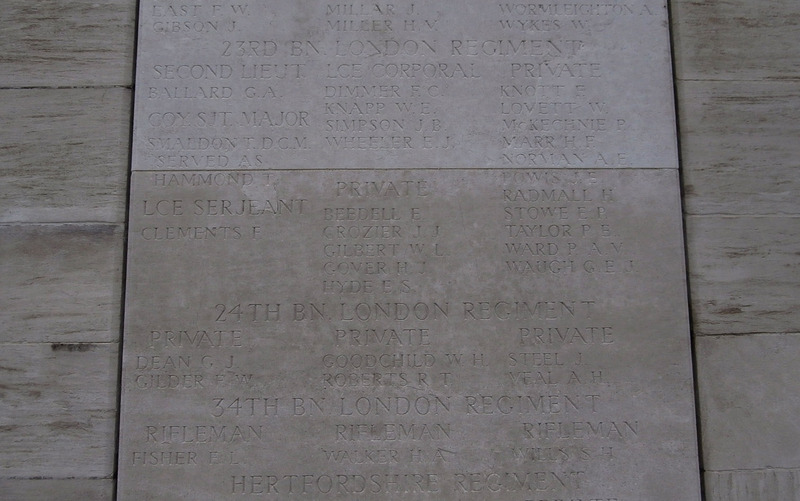 Rifleman William Dell aged 20 was killed on the last day of November and is commemorated on the Cambrai Memorial about seventy miles north of Paris. He’s also got Summerstown company there – by the most extraordinary coincidence, Joseph Lucas’ brother Albert was killed on the same day. A third local boy, Eric Tibbenham from Thurso Street is also here, making 30th November 1917 one of the darkest days in the Summerstown182 saga. Albert Dell is pictured on the right of the above photo and William Dell is on the left of the photograph below, both very kindly provided by Liz Yates, a great niece of the Dell brothers. Two Dell brothers, one in Belgium, one in France. Both lost without trace, their parents, Albert and Ada waiting for a year to have some idea what had happened to them. In the same stark paragraph in the December 1918 issue of the St Mary’s parish magazine which announces the loss of Thomas Charles Milton, the Balloon Man, Reverend John Robinson reported ‘Albert Arthur Dell, Machine Guns Corps, has been missing since September 1917; his brother William Frederick Dell, London Regiment has been missing since November 1917.’ In the absent voters list, prepared for the December 1918 General Election, they are both listed. 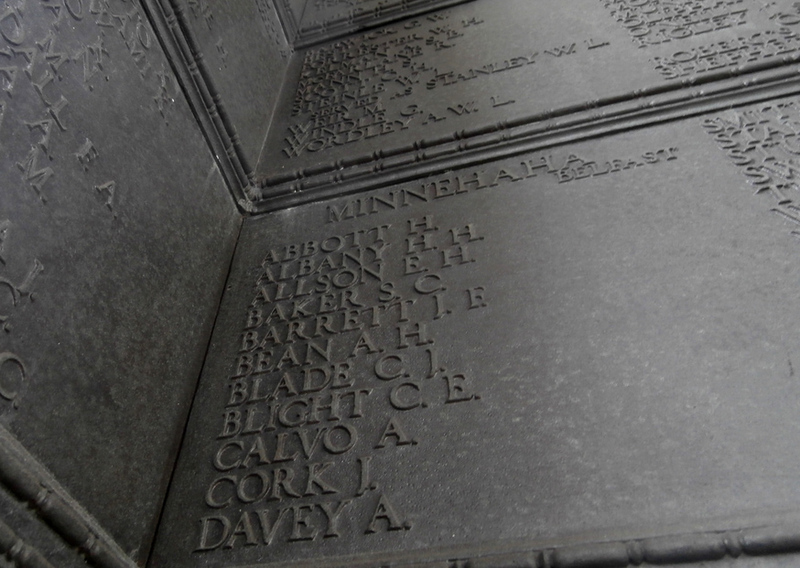 The names would have been collected in the early part of 1918 from next-of-kin and one can only imagine Albert and Ada giving their sons’ names in hope. Not having heard from them since the tumultuous Autumn battles of Passchendaele and Cambrai, they must have feared the worst for their boys. UPDATE (August 2017): In November 2014 a contingent of the Dell family joined us on a memorable Summerstown182 Walk. It was getting dark when we reached our final stopping point, 35 Pevensey Road and as we stood outside the house and quietly reflected, the gate swung gently open. It was one of those moments. Liz and Eileen who provided photographs of their relatives have since become regular correspondents and great supporters of our project. Three generations of the family attended St Mary’s Church Remembrance Sunday service a few years ago and laid wreaths. They have shared photographs of Albert and William and contributed greatly to our knowledge of the Dell brothers. Most memorably Eileen showed us the beautiful collection of embroidered postcards which Albert sent home when he was in France. These inspired us to do a ‘postcard-making’ craft activity at our lottery funding launch event in St Mary’s Church last September. Eileen came along to show people the originals and it was a great success with even ‘Sidney Lewis’ himself getting stuck in! 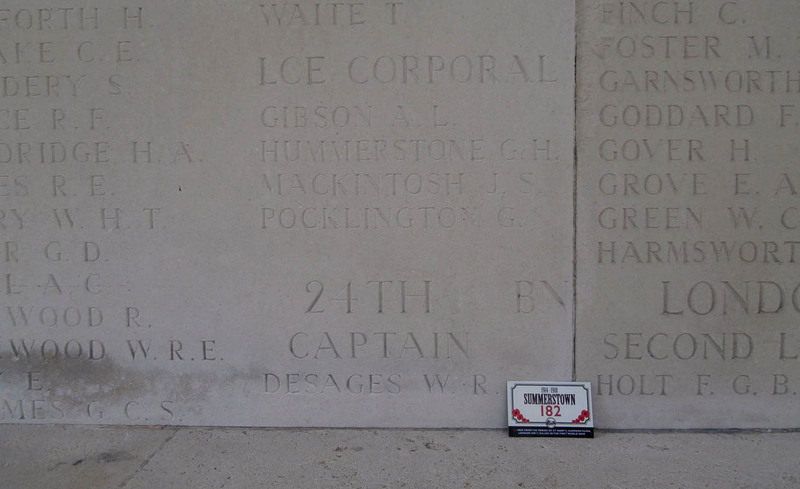 We’ve visited the places where the Dell brothers names are commemorated at Tyne Cot and Cambrai. Albert was on our minds when we were back at Tyne Cot recently for the Passchendaele Centenary Commemoration. We’ve recently had more family contact us from the United States and when they are ready to visit the area we look forward to also giving them a tour.